I've made known over the years how fond I am of cleansing wipes. 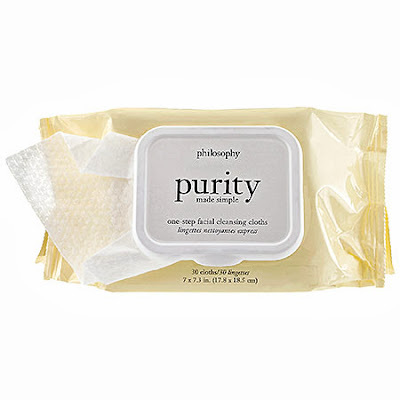 Well, I'm adding a new favorite to the list -- Philosophy Purity Made Simple One-Step Facial Cleansing Cloths. You may remember that I first talked about these in my recent video about my travel beauty regimen. I really do love how easy these make cleansing my face while on the go -- I travel so frequently that it's nice to know I have a go-to cleansing wipe that will make my skin feel fresh and clean. I also love that these wipes are gentle enough even for my super sensitive skin. This is thanks to ingredients like meadowfoam seed oil, rosa centifolia flower oil and carrot seed oil, which not only make the cloths remove dirt, grime and (even waterproof) makeup instantly, but result in the cloths smelling pretty darn fantastic! 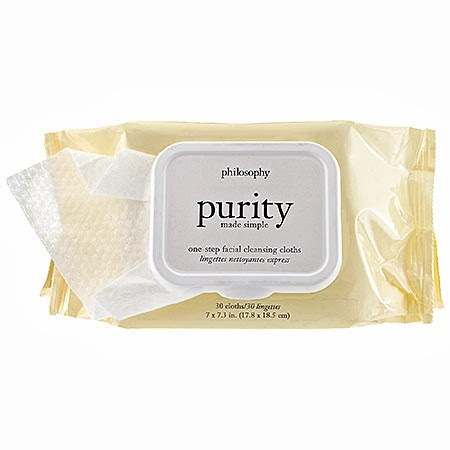 Philosophy Purity Made Simple One-Step Facial Cleansing Cloths are $15 for a pack of 30 at sephora.com.